As I sit down to type this post, five children are running wild in my back yard. Two are throwing dozens of colorful plastic balls over the net enclosure, while the other three bat them right back out. A few balls will likely land over the cement brick wall, resulting in tears, anger, and ultimately laughter as stories are made about Crazy Ed pulling “magic circles” out of his pool filter. As the coffee hums, the cell phone rings, the house phone follows in suit, and dinner sits uncooked on top of my kitchen counter, I think of my husband: My very organized, methodical, practical husband. For seconds, how much longer am I going to trade services – taking Miss L home a few days a week in exchange for acupuncture? Wouldn’t less chaos be equally as effective in calming down Stink’s tics? Depending on my mood, I might be furious with my logical mate. While he means no harm by his comment, I might view it as insensitive. When he married me, I was a vintage wearing/cat eyed sporting/card-carrying WGA TV comedy writer. He wasn’t saying, “I Do” to Ms. Homemaker U.S.A.. These days, the only thing funny is my sense of domesticity – and believe me – we’re not always laughing. On some days, I might blow his comments off. “That’s just Rex,” I might chide, too happy with my writing gigs or $12.75 Ebay windfall to really ruminate on his remark. But these days, I often think something else. What if he’s not being a selfish male? What if he just can’t help it? David Finch’s wife knows a bit about this question. She was fed up with her rigid husband who threw baby tantrums over anything from dishes not being done correctly to having to deal with any change in their schedule that came with children. After five years of marriage, they were no longer friends and teetering on divorce. Unlike a lot of folk who might ignore these results, Finch got an official diagnosis from a doctor. Instead of freaking out, he felt relief. He finally realized that his need for control was not entirely his fault: he was wired that way. But perhaps even more astounding than his acceptance of this irreversible condition was his determination to transform his marriage in spite of it. The result? A New York Times bestselling book. 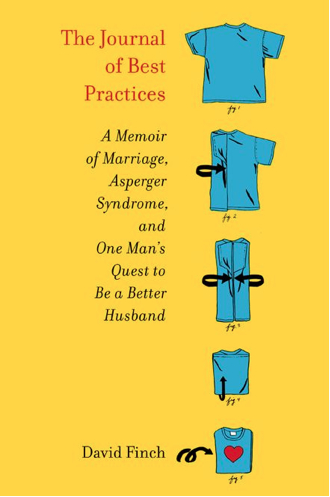 He titled it, The Journal of Best Practices: A Memoir of Marriage, Asperger Syndrome, and One Man’s Quest to Be a Better Husband. Published by Simon and Schuster, Finch spares no details in walking us through his transformation. Using a detailed list of observations he’d written to himself, Finch came up with a set of best practices to elevate him from the dog house to beloved man of the house. Aspergers can take on many functions, but the hallmark of this disorder is monumental self-focus. Another way of saying this is that the person does not, inherently, possess empathy. As a creative person who feels everything from a wacky gleam in my mom’s eye to the way a dissected frog might feel before being diced in two by a seventh grader, I used to think lack of empathy meant lack of feelings. But when I look at some of my own husband’s responses to life situations (sobbing in the driveway when my daughter was being whisked off to emergency for a chest cough, or breaking down over the birth Stink) I realize now how wrong I was. It’s not that folk with Aspergers don’t feel – they just can’t always put themselves in someone else’s shoes and sense how they feel. Understanding on a cerebral level is a far cry from acceptance on a soulful one. Marriage to someone like this can be taxing to say the least. One wouldn’t be human if they didn’t find it maddening. A spouse can feel cheated. “Isn’t a relationship about give and take?” many neurotypical mates might balk. Finch’s response is yes, and so is mine. What Finch succeeded out so brilliantly, both in real life as well as on the written page, is realizing while he might not be able to understand his wife’s needs on an intuitive level, he can respond in a practiced way that honors her because he loves her. It’s the same with my marriage, and perhaps yours. Aspbergers or not, all relationships have issues that can’t be wrapped up in a shiny happy bow. Like a tic, you never know what’s going to pop up out of the blue. We simply need to respond well – and sometimes that takes practice. “Rex does not have Aspergers!” some friends or family might say. “He’s just being an extreme male!” That is quite possible. But like my son’s Tourettes, I can’t change what is. Either my mate is just very very very set (we’re talking “footprints that have dried for ten years in cement” set) in doing things a certain way or he has Aspergers. Unless he’s diagnosed, I’ll never know. I can only change how I respond to it. Like Finch’s wife, I hope I’m doing so with love, honor, humor, gentle pushings toward change and a whole lot of grace. I can only hope my husband continues to work toward understanding me the way Finch did his wife. I might not get a best selling book out of Rex, but it would be a lovely new chapter for us. Until then, for those of you who are also dealing with Aspergers with your spouses or perhaps your sons or daughters (it’s often a co-morbid condition with T.S.) please take hope from Finch’s book. It is not the end of the world. It’s simply a different way of thinking. Life isn’t always easy, but it can be challenging, interesting and, as Finch’s writing attests to, hilarious. As I wait for my husband to return from a 12 hour work day, my son is complaining about leaky liquid coming from his arse. I have seven children waiting to eat tacos. I have 2 articles due and I’m PMSing like a crazy person. If my hubby can come home to all that, I can accept some of his quirks. He loves me. I love him. Like Kristen, I’m in this marriage for the long haul. With Finch’s book, I’m joyful to know that it’s possible to have less survival and more thriving. I wish the same for all of you, both in T.S., marriage and all of life’s challenges. Also, special thanks to Simon and Schuster for sending me this book and allowing me to sing its praises. Here’s a fun promo of what turned out to be one of the most insightful books I’ve read this year. Previous postGluten Free Living/Vitamins/More Revelations! Next postThinking Big: In Life and T.S. At the end of the day, no matter what the diagnosis (or not! ), if we respond to our spouse’s needs in a practiced way which honors them, we have a marriage. Where I’m trying to succeed is by parenting my son (e.g. social training, etc and PATIENCE) in such a way that my son’s wife will look away from his quirks and lovingly teach him how to love her. @Gretchen – I believe I found you on the internet randomly about five years ago when you posted about your son doing Willy Wonka. He touched my heart. And now you, too, are so amazing and dear to me. I am proud to know you. Your son WILL be an awesome hubby and his wife will be lucky to have you for a MIL! This is such a good reminder for everyone to be as accepting and understanding of the different ways we all see and react to the world. It gives us an opportunity to practice patience too. I think all wives can relate to this on some level. I can’t count how many times I’ve heard my husband ask “Why are you so upset?” and he really doesn’t know why. I’ve always thought it was good for me to have someone close at hand to remind me that there are lots of different ways to react to life’s rough spots and that maybe my reaction might be a little extreme. ” I think all wives can relate to this on some level.” Wives, spouses, partners… but especially those of us partnered with men (research shows testosterone suppresses empathy). I’m a survivor of 20 yrs marriage and it isn’t because it’s been a bed of roses. I love this man in the extreme. I wouldn’t have ever guessed he has mild autism because he doesn’t show the more obvious signs, but there are definitely some serious empathy issues. Ones that I’ve taken personally over the years. Ones that I’ve cried over and and at very dark moments “decided” I had made a “huge mistake” marrying this man. Only very recently, doing some reading on my own about mild autistic spectrum issues (unrelated to my husband), have I begun to view his “hardness” as a biologically wired empathy deficit. Plus, as I’ve long believed, there are nurture factors involved here, too. I recall he and I leaving to fly very far away for our wedding, his mother dropped us off at the airport. I watched from the curb as he got our luggage out of the car. He turned to join me and his mother turned to get back in her car. No kiss goodbye. No hug. No well wishing. (She was going to join the wedding party in a week but still, on the eve of his wedding?) I told him to get over there and give his mother a hug! So in this autism research, I have also begun to see she is very low on empathy as well (and she is highly visual-spacial who throws pout tantrums when things don’t go her way). Well, it isn’t that I’ve just begun to see it, I’ve always seen it, but never from this clinical vantage point. I took her brusque ways personally, too, cried many tears for many years. Sorry to go on so but you’ve touched a personal chord here. I want to read this book. I also want to ask whether the author gave a link to the online diagnostic test? I’d love to check it out. A great post & although Asberger’s has not yet touched my life I’d be interested in reading more about this. As Jennifer above pointed out “This is such a good reminder for everyone to be as accepting and understanding of the different ways we all see and react to the world”. I am learning this through my son’s Tics/TS…whatever you want to call it and I always appreciate ready your posts & insight. Great post Andrea!! Yes…so true that we can all learn to be more accepting of others!!! !